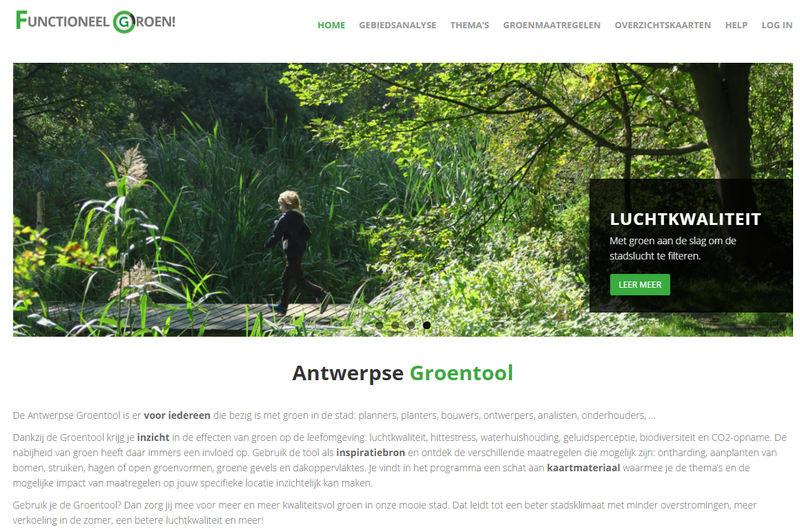 Meet the Antwerp Green Tool: an online application that provides insight into the benefits of urban green space. VITO developed the app at the request of the city of Antwerp, which wants to take a more focused approach to making the city green and thus improving the quality of life in the city. Awareness of the positive impact of greenery on the living environment is not new. Green space in the city not only keeps the temperature under control, it also improves air quality, has a positive influence on managing noise, water resources and biodiversity, offers opportunities for recreation and – last but not least – is good for the health of local residents. The Antwerp city government is also convinced of the importance of green space in the city. It wishes to take a more focused approach to this and invest more in greenery. And for assistance it turned to VITO. The result is a user-friendly online tool – the Green Tool – which calculates the benefits of green investments within seven themes: heat, air quality, noise, CO2 storage, biodiversity, recreation and water. The tool, which will be used by the Antwerp municipal services, will be put into use in October 2016. Stijn Vranckx of VITO: "We have been using our heat maps for some time now when advising cities about the most effective options available to protect themselves against the effects of global warming. With the Green Tool, we take this a step further. All of our knowledge on ecosystems, biodiversity and the various environmental themes has been incorporated in the app. For a selected area we superimpose maps with different themes: heat maps, air quality maps, land use maps ... This gives you insight into the situation: how much pavement is there, how much greenery, how many roofs and which issues present challenges. Then the tool shows a list of suitable green measures for that area and their impact. On the website you will also find a comprehensive explanation of all the themes and you can read what the impact can be of different types of vegetation." Iris Gommers, Sustainable City Coordinator for the City of Antwerp: "We had the Antwerp Green Tool developed to support employees of various city services in their tasks and in preparing designs and advice. The tool also serves as input for the development of plans such as the local Antwerp Green Plans and updating the strategic Regional Zoning Plan. We felt it was important that the application is very user-friendly. This ensures that the city services will be able to use the wealth of information that Antwerp has more efficiently and more frequently."